It’s being called one of the most controversial endings to a major tennis tournament match in history. Serena Williams was ousted from the U.S. Open and denied a trip to the finals due to a penalty she received for screaming at a line judge. The referee intepreted that as a “threat” and awarded Clijsters a point. 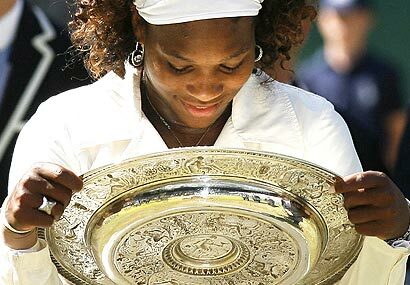 Unfortunately, since the incident happened on match point, Williams was declared the loser of the match. Tennis stars Venus and Serena Williams have become part owners of the NFL’s Miami Dolphins. The pair are the first African-American women to have an ownership stake in an NFL football team. Saying “God didn’t make cookie cutters,” tennis player Serena Williams has come out to defend herself against a blistering column written by Jason Whitlock last week. Despite winning three of the last four majors in womens tennis and owning 11 Grand Slam titles, Williams found herself on the wrong end of Whitlock’s keyboard. Whitlock is one of the most entertaining columnists in America. Usually his columns are intelligent, insightful and well-reasoned. Realising the hypocrisy of his criticizing anyone’s chubbiness, Whitlock concludes his article by saying weight is stopping Serena Williams from “fulfilling her destiny.” Meanwhile, as a sportswriter, Whitlock writes that by being “plump and lazy” himself, he IS actually fulfilling his destiny.